Your first prenatal appointment usually occurs between 8 to 10 weeks based on your LMP (last menstrual period). Depending on where you live and your doctor, things might vary from what happened at my appointment (I live in Minnesota), so it's always best to ask your doctor in advance what to expect before going in if you are nervous or anxious. When my husband and I arrived at my appointment, we were greeted by my OBGYN's assistant. She started by asking us some questions about our health history, and then of course when I had my last period. What I considered my last period was way back in February, so she plugged that into her computer and boom, I was all of a sudden 15 weeks. I didn't feel that was right since I have irregular cycles due to PCOS and I didn't get a positive test until April (trying every few days). She said my OBGYN will come in and we'll figure out the dating from there. When my OBGYN entered the room, I explained to her that I didn't think I was that far along based on the notes I had. I had spotted near the end of March, so she put that in as my period instead and it corresponded with when I got the positive pregnancy test, putting me at 10 weeks. I didn't consider that a period since it only lasted one day, but I have PCOS, so I guess anything is possible! She then did a pelvic exam since apparently, you can verify how far along you are by how big your uterus is! This was quite uncomfortable and didn't result in much since I, unfortunately, have a tilted uterus, so in the end they will have to confirm the dating at the nuchal translucency screening, which is an ultrasound I'll get at 12 weeks to look for chromosomal abnormalities (it is optional, but then my first ultrasound would not be until 18-20 weeks for the anatomy scan, so we chose to do it). After the uncomfortable pelvic exam, we had the amazing experience of hearing our baby's heartbeat! My OBGYN did warn us that it can be hard to find it with the Doppler this early and that having a tilted uterus might make it harder, but she found it! It made everything seem so real since up to that point we didn't have much proof that there was something growing in there! Will PCOS affect my pregnancy in any way? My OBGYN said it increases the risk of gestational diabetes, but it's still only 20% (for those without PCOS or aren't overweight it's only 5%). Learn more about PCOS in this post. Yes! She also gave me a list of other safe medications, but glad I asked about this one since I noticed it wasn't on the list, probably because motion sickness is not as important as pain and allergy medication. Would you recommend having a Doula? My OBGYN is all for natural birth and said yes! The hospital provides one and I'll get a list of names in my 2nd Trimester folder if I'd like to get in touch with one sooner. She said it's always great to have an expert for support when you are in labor. To read more about Doula's, check out this post. Do you recommend the blood test for finding out the gender and genetic testing? This is the new hot thing on the Internet (you may have heard of the Harmony test or Panorama test), so I asked my OBGYN about it since you can find out the gender sooner (as early as 10 weeks! ), however insurance doesn't usually cover it unless you are high risk or over 35, so it would cost around $500 out of pocket. Also, the false positive rate for down syndrome is 20% for women under 35, so she does not recommend it. My husband was no longer interested in it after hearing how high the false positive was and I lost interest at the cost! 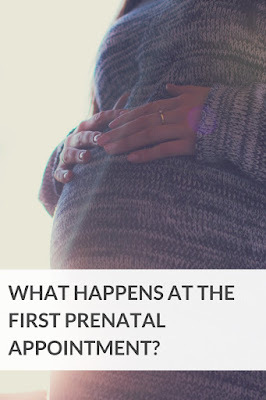 However, she recommended the nuchal translucency screening (NT screening), which is covered by insurance, and will give you the same genetic tests, but without knowing the gender. It has a lower false positive rate, and you get an ultrasound, so we decided to do that one! It has to be done between 11-14 weeks though, so if you want to do it, get it scheduled asap! You can read about our experience here. I am overweight, so she recommended 15-25 pounds for me. This will definitely vary depending on your current starting weight, so do not go by what was recommended for me, ask your doctor! At the end of our appointment, she gave me a folder full of information. She explained that we will get one of these lovely packets for each trimester. It contained everything from safe medication to what not to eat/drink, and a lot of pamphlets promoting breastfeeding, also quite a few about smoking and how to quit (we don't smoke, so they probably just give everyone the same amount of information). We scheduled my next prenatal appointment for 4 weeks out (my ultrasound will be done at a different building, so they called us later to set up the NT screening) and all that was left was for me to pee in a cup (STD testing and bacteria testing) and then the appointment was over! I just want to reiterate that what happens at your first appointment might vary from mine, but this gives you an idea of what might happen at yours. Feel free to comment about what happened at your first prenatal appointment! I'm sure other expecting mamas would love to hear your experiences! I love that first appointment when you're pregnant. Especially getting to hear the baby's heartbeat for the first time. My husband was really excited but truthfully I was kind of bummed because I wanted twins but didn't get it. I wanted twins too, but now after having one, I realize twins would have been a nightmare! My little one still drives me nuts sometimes, but I love her to bits. I don't know how anyone manages more than one at a time! How exciting! The first appointment can always be tough on figuring out the timing...we were off by a week or two as well. Great questions to ask. Pinning for other Mamas! This s a very helpful post, esp the early gender recognition test- I wasn't aware of this. I didn't hear of it until I joined forums online when I was pregnant! I was like is this for real? And it is, but it is way too costly. If we had a history of genetic disorders, then it might be worth it, but just to find out gender? Seems better save that money and wait till the anatomy scan.